Animal Husbandry and Dairy Development Minister Talasani Srinivas Yadav launched Vijaya mineral water at the Secretariat on Friday, the day he assumed charge as the Minister.The Minister also launched Vijaya ghee pet jars and released animal health cards. Speaking on the occasion, the Minister said that the Vijaya Dairy products were neglected in marketing earlier.Now, the State government is committed to improve their sales. After the bifurcation of the State, the Vijaya Dairy achieved tremendous progress, the Minister claimed. There was a great demand for Vijaya ghee, dhood peda and ice cream. The Vijaya Dairy would be in number one place in the sale of milk products, Srinivas Yadav said. The government is giving sheep worth Rs 5,000 core to shepherds. 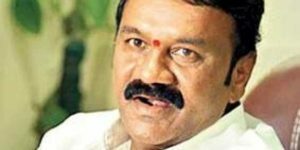 The veterinary clinics would be developed with an estimated cost of Rs 12.18 crore, he said.The Minister alleged that the fisheries’ sector was neglected in the combined AP. The combined AP allotted only Rs 5 core to the fisheries department, he recalled. After the formation of Telangana, the government allotted Rs 101 crore for the fisheries, he said.